The Virginia tech 200 medley relay squad of Charlie Higgins, Emmett Dignan, Greg Mahon and Greg Morgan capture the opening event of the 2012 ACC Men's Swimming and Diving Championships being held at the Christiansburg Aquatic Center which is home to the Virginia Tech Swimming and Diving program. 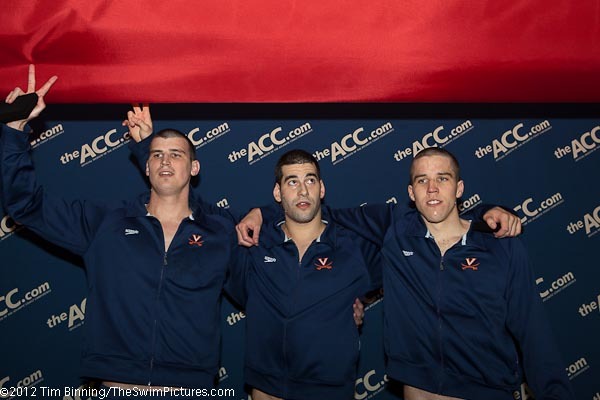 The University of Virginia team of Peter Geissinger, Tom Barrett, Parker Camp and David Karasek win the 800 free relay in 6:18.35 with an NCAA qualifying "A" time at the 2012 ACC Men's Swimming and Diving Championship. 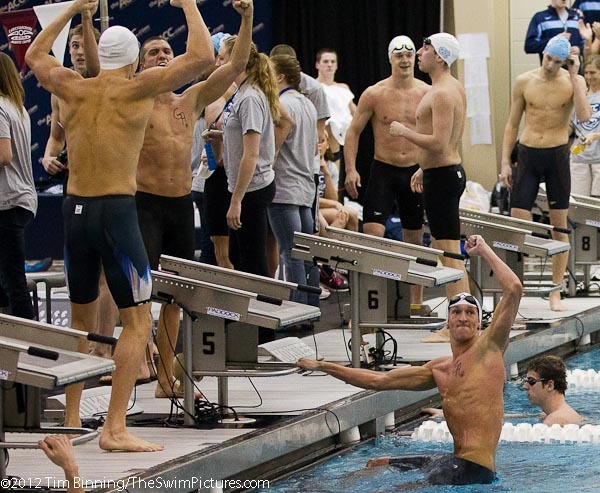 Florida State wins the 200 free relay with the team of Paul Murray, Trice Bailey, David Sanders and Mark Weber. Logan Shinholser prepares to dive during the tree meter finals at the 2012 ACC Women's Swimming and Diving championships. 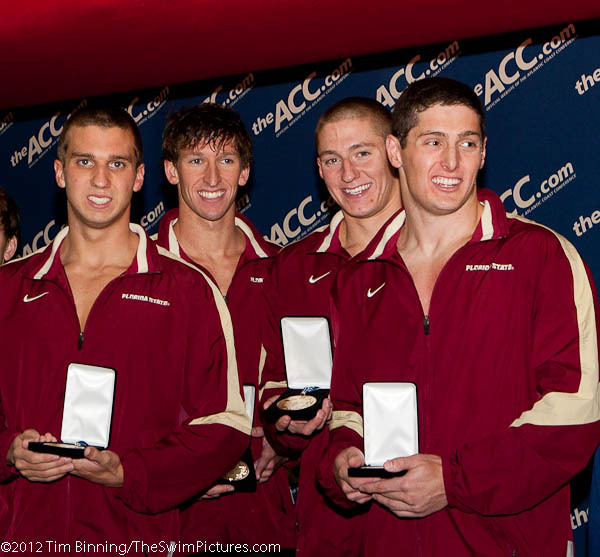 The ACC men diver's compete during the women's ACC championships. Their scores are added to their men's swimming team scores the following week when men's swimming competition takes place. Mateo De Angulo of Florida State captures the 500 free at the 2012 ACC Men's Swimming and Diving Championships held at the Christiansburg Aquatic Center in Christiansburg, Virginia. 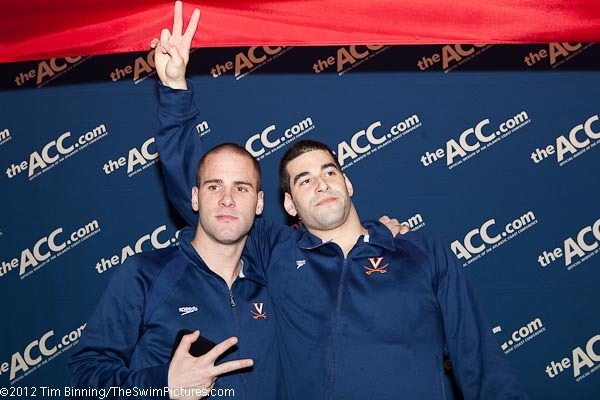 David Karasek (R) and John Houser (L) went 1-2 in the 200 IM for Virginia. 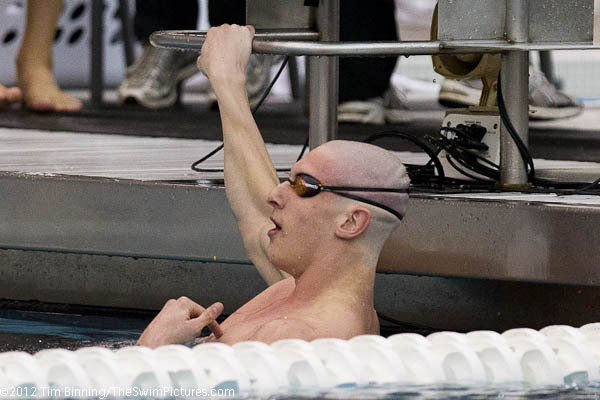 Clemson Junior Eric Bruck captures the 50 free in 19.41. 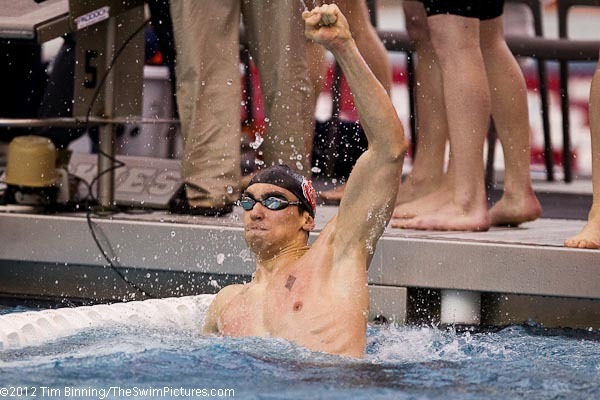 North Carolina State Sophomore Jonathan Boffa celebrates a victory in the 400 medley relay after splitting 42.22 on the anchor leg. 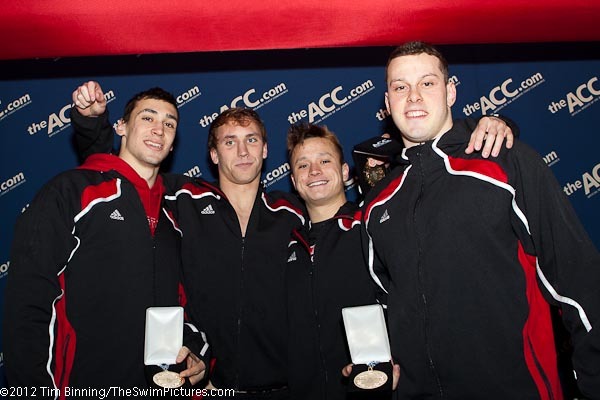 The NC State team of Ivan Kopas, Ian Bishop, Barrett Miesfeld and Jonathan Boffa on the victory stand following their win in the 400 medley relay win on the third night of competition at the 2012 ACC Men's Swimming and Diving Championships. 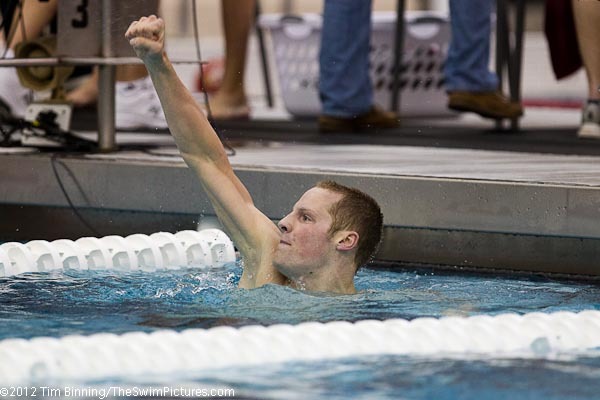 UNC Junior Tom Luchsinger takes the 400 IM in 3:46.91. 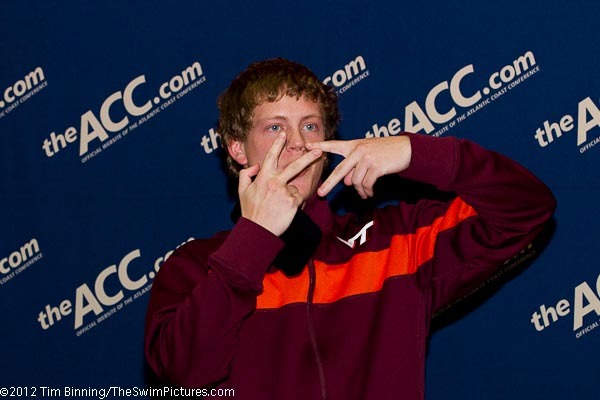 Virginia Tech Junior Greg Mahon wins the 100 fly in 46.55 with teammate Karl Botha taking third. Virginia goes 1-2-3 in the 200 free with Tom Barrett (L) taking second, David Karasek (middle) first and Parker Camp (r) third. 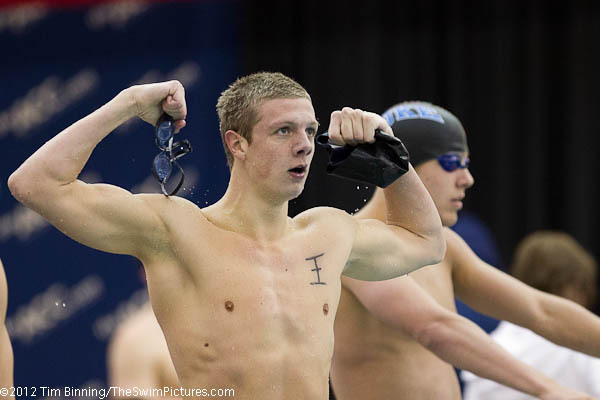 Duke Freshman Piotr Safronczyk take sthe 100 breast in 53.61. 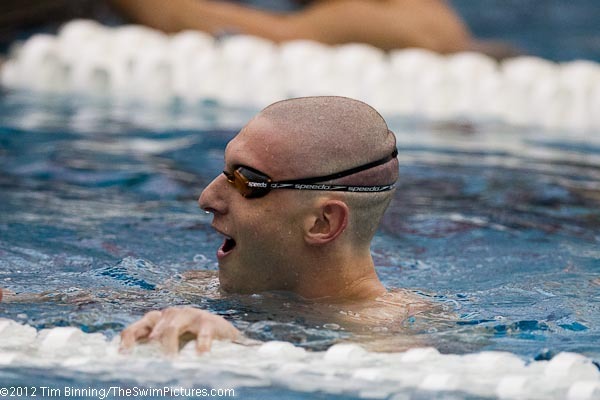 Virginia Tech Junior Zach McGinnis wins the 100 back in 46.79 to lead the Hokies to a 1-3 finish. 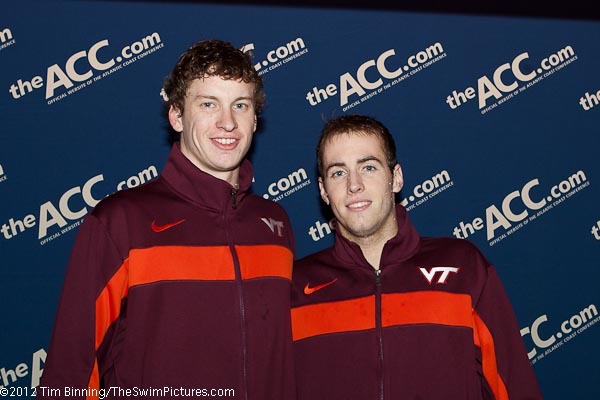 Zach McGinnis (l) and Charlie Higgins (r) go 1-3 for Virginia Tech in the 100 back. 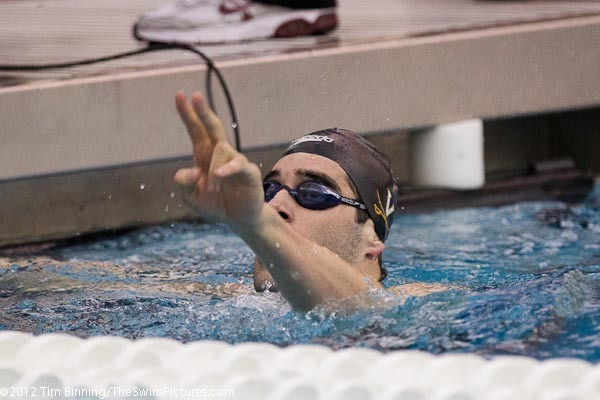 Mateo De Angulo of Florida State adds to his victory in the 500 with a first place finish in the 1650 free on the final night of competition at the 2012 ACC Men's Swimming and Diving Championships held at the Christiansburg Aquatic Center. 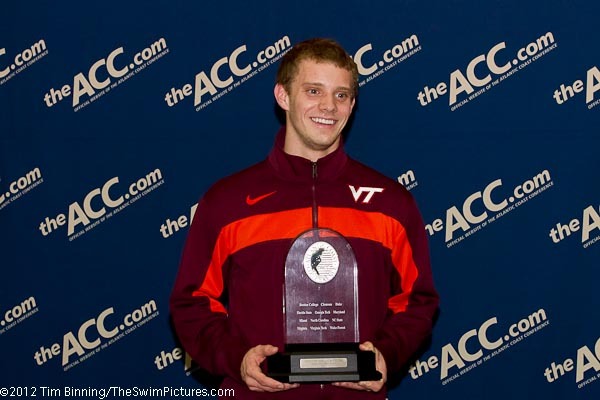 Chris Dart of Clemson repeats as the 200 back champion at the 2012 ACC Men's Swimming and Diving Championships. 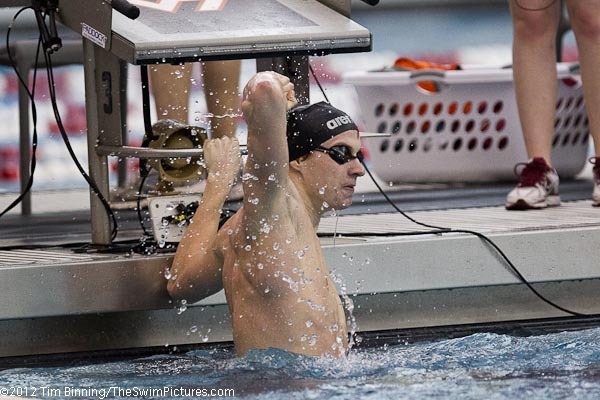 Clemson Junior Eric Bruck adds to his 50 free title with a victory in the 100 free at hte 2012 ACC Men's Swimming and Diving Championships. 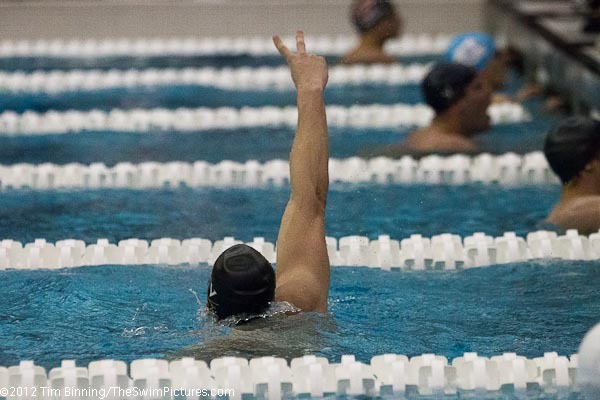 The victory is to be the final ACC victory for Clemson Swimming as the program has been cancelled by the university. 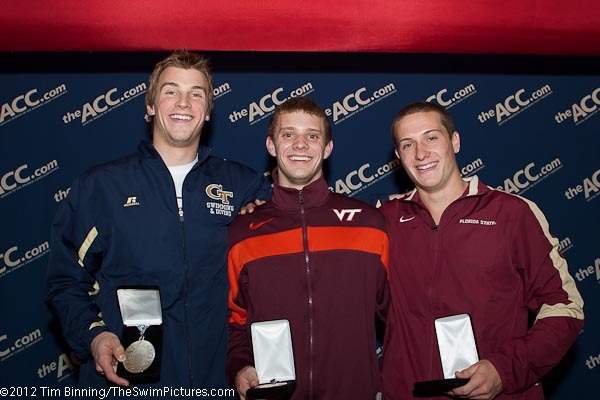 Sophomore Ryan Hawkins of Virginia Tech wins the Platform Diving with teammate Logan Shinholser less than a point behind in second place at the 2012 ACC Men's Swimming and Diving Championships. 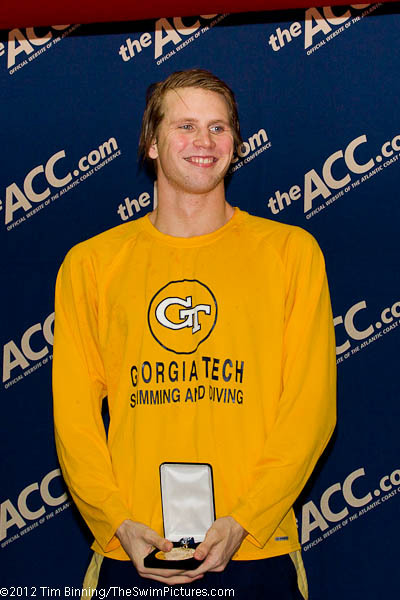 Georgia Tech Sophomore Anton Lagerqvist came from behind to win the 200 breast for the Yellow Jackets at the 2012 ACC Men's Swimming and Diving Championships. 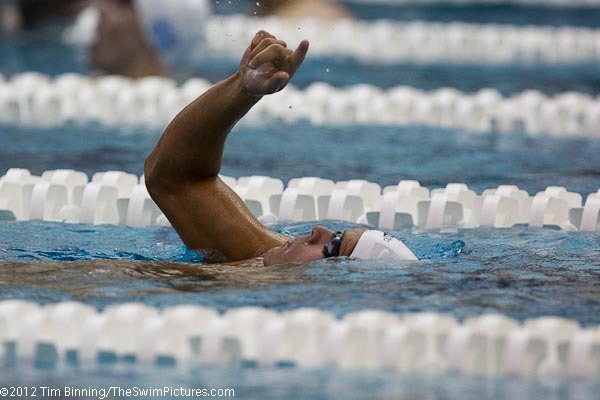 Tom Luchsinger, a UNC Junior, won his second event of the 2012 ACC Men's Swimming and Diving Championships taking the 200 fly in 1:44.53. 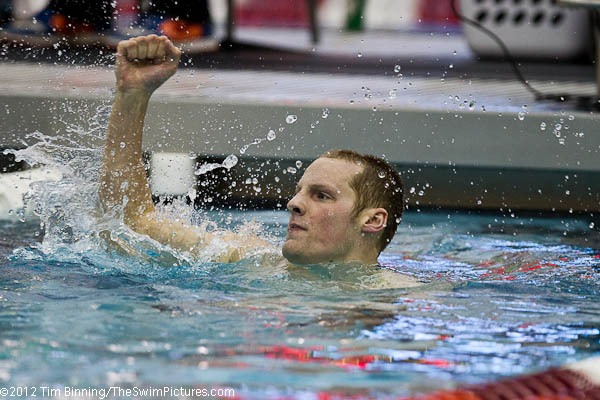 Earlier he won the 400 IM. 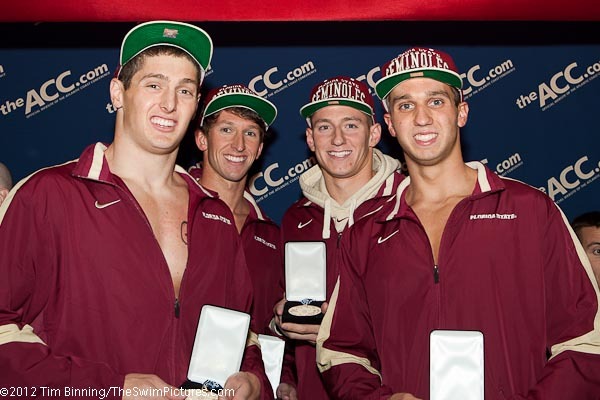 The Florida State team of Paul Murray, Trice Bailey, David Sanders and Mark Weber won the 400 free relay to close out competition at the 2012 ACC Men's Swimming and Diving Championships. The quartet earlier won the 200 free relay. All four are underclassmen who will be returning to competition next year. 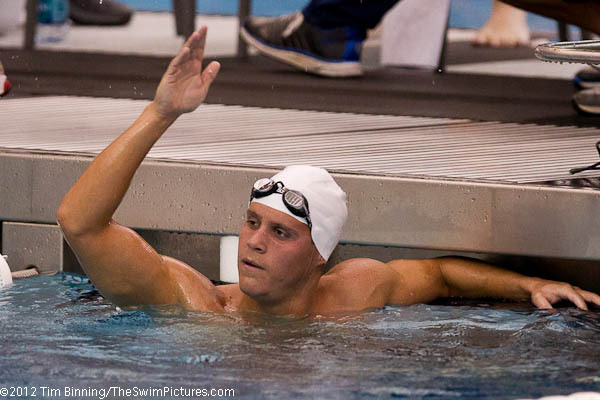 Mateo De Angulo , a Florida State senior, was named Swimmer of the Meet at the 2012 ACC Men's Swimming and Diving Championships. De Angelo won the 500 free and 1650 free and took second in the 400 IM. 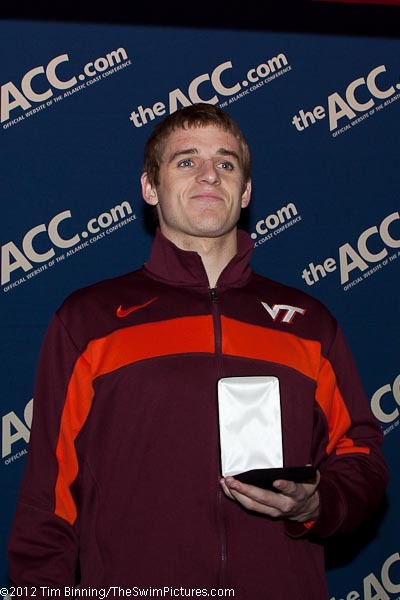 Virginia Tech junior, Logan Shinholser was named Diver of the Meet at the 2012 ACC Men's Swimming and Diving Championships. Shinholser won the 1 meter and 3 meter boards while taking second in platform diving.